The driver of an Uber operated saloon car with registration number APP 145 EE, would remain grateful to God. Next to God will be operatives of Rapid Respond Squad, RRS, who stopped him and the two male passengers for a random ‘stop and search’ on Wednesday, March 14, 2018. 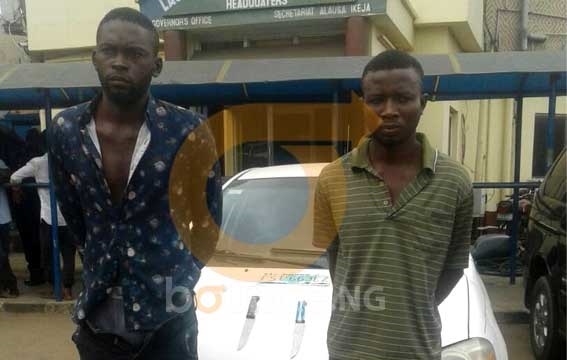 The passengers, Simon Tyozemda, 27 from Benue State and Lucky Friday, 24 from Delta State were arrested with two long knives and substance suspected to be weed hidden under the carpet. Their plan was to lead the driver to a deserted location on Lekki-Epe Expressway, Lagos, kill him and take away his car. One of them, Simon, confessed to having ordered the taxi via his girlfriend’s Uber mobile app around 11PM. This is their usual mode of operation and they have killed quite a number of drivers. Investigation revealed that the same duo killed a Taxify driver and snatched his Toyota Corolla, FST 663 EZ along Badore Road, Ajah around 2AM in the same manner in February 2018. The corpse of that driver is still in the mortuary while his car has been recovered. Scarier is the realization that the killers formed their robbery gang in Kirikiri prison, while the society thought they were being reformed. “It was the same business that took me to Kirikiri prison. I was introduced into it by Michael. Unfortunately for me, I was arrested while Michael escaped. “I spent four months behind bar. It is sad I’m being arrested again over the same business,” he confessed. Police Commissioner, Imohimi Edgal, while parading the suspects advised Uber and Taxify drivers to avoid taking passengers to unknown or lonely destinations. The expectation is that all suspects would be charged to court at the end of investigations. Sadly, another jail sentence will only make them stronger, smarter and wilder.